Hey Sumo-lings, Welcome to Analytify! We are glad to have you on board. 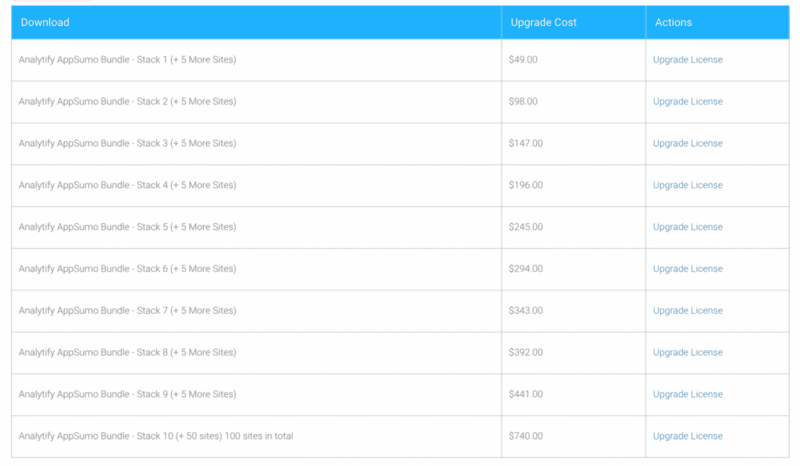 By Stacking additional codes, you could upgrade the deal and this will add 5 sites more to your bucket. So will be 50 sites in total. We heard you Sumo-lings and added Stack 10 with 50 more sites. So, you can now have 100 sites in total. To redeem Stacking additional codes, follow the steps below. Go to the Purchase History Tab. History shows you the recent purchase, Click on “View licenses” from License keys Column. Next, you will see a list of Items. Go to the last column “upgrades” of Item “Analytify AppSumo Bundle – Exclusive Lifetime Deal (5 Sites)” and click on “view upgrades” now. This page will show you all the possible stack upgrades from your first main stack that had 5 sites. Each code you bought from AppSumo has $49 discount. So, If you bought 4 codes, Go with Stack 1 (+ 5 sites) because you have already redeemed the main stack (+ 5 sites) and have used one AppSumo code. Clicking on “Upgrade License” will take you the same check out the form, Enter your second AppSumo Stacking code in the Discount field and hit Apply. Click Purchase, you will be taken to Purchase Confirmation page that contains the same license keys and files to download that you had in the first main purchase. Repeat step 7 and step 8 until you have used all codes. Enjoy, you'll now have lifetime access to 20 sites now. This way, you will have one license key for all of your sites.